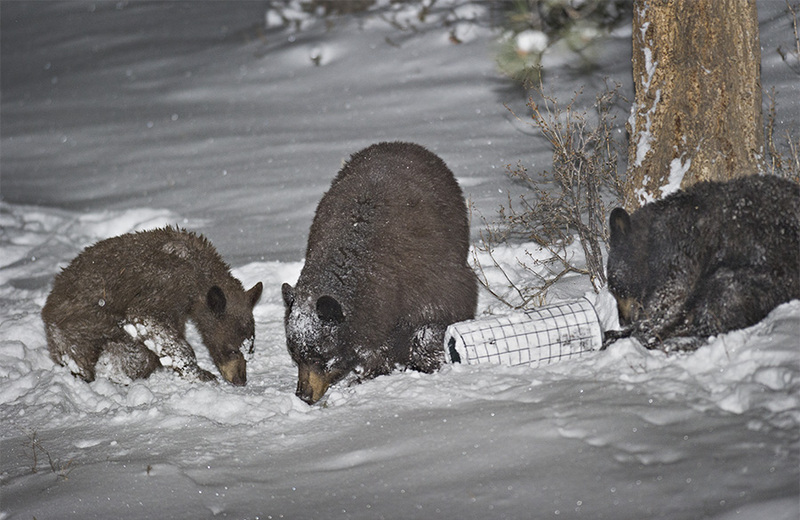 A sow black bear and her two cubs foraging at night in a spring snow storm. I have been diligently monitoring the higher altitude weather patterns , reading wildlife reports and checking with locals to see if the bears have been coming out of hibernation. There have been no confirmed reports of activity in our area though certain regions of the state have definitely seen bruin movement recently. With an armory of bird feeders scattered about our property, I generally begin retrieving the feeding stations at night about mid April. However, with all our late spring snow storms I thought a could fudge a bit. I told myself the other day, “Ok, Eric remember to start bringing in the feeders this weekend ( as in three days from now). I was pretty confident this last couple of storms carrying unseasonably cold weather would perhaps give me a reprieve. About 10 p.m. this evening our two Weimeraners exploded into horrific blood curdling howls and barks which from past recollection warned us there were either bears, fox or coyotes in our midst. Sure enough a sow black bear with two cubs in tow discovered one of our rather tall “squirrel-proof” feeders in the back acreage. Mind you “squirrel-proof” means nothing to a hungry bear. This fuzzy, snow crusted trio was seen tumbling and spinning the wire contraption all about the ground before burying their snouts in the fresh blanket of snow picking out morsels of bird seed. Knowing I all but lost the battle on that tall feeder, I started scrambling about the property in my untied Sorels in the extremely dark cover of night peering over my shoulder at every feeder I grabbed fearing the worst. In short order all the remaining feeders were safely placed in the garage and all that was left was to grab a photo of the spring marauders.